Ever stayed in a Hilton, Hyatt or Marriott hotel? Chances are you would have enjoyed your stay there. These are what we call luxury hotel brands that are famous for their comfort, style and luxury that they offer to tourists and business people. Today, we are going to learn about the intermarket analysis effect of these luxury hotel brands on the economy and stock market. These luxury hotel brands have been in a strong uptrend. What many do not know is how they can act as an indication of wealth and growing economy. If people are feeling wealthier, they will prefer to stay in a branded hotel. On the other hand, when times are bad, companies cut cost and send their employees to stay in less expensive hotels. Holiday makers would not mind staying in a budget hotel. After all, they are only in the room for less than 8 hours most of the time. What if you are earning more and more? You wouldn't mind shelling out an extra $100 each day to stay in a better hotel right. The increased room occupancy in luxury hotels are reflected in the increased earnings. The bottom line will eventually help to propel the company's stock higher. Since these luxury hotel brands have branches all over the world, you could say that they truly reflect growing wealth all over the world. The chart above is the daily chart of Marriott. This stock has gone up by about 50% since September 2017. An incredible feat when you consider this is an elephant in the stock market. 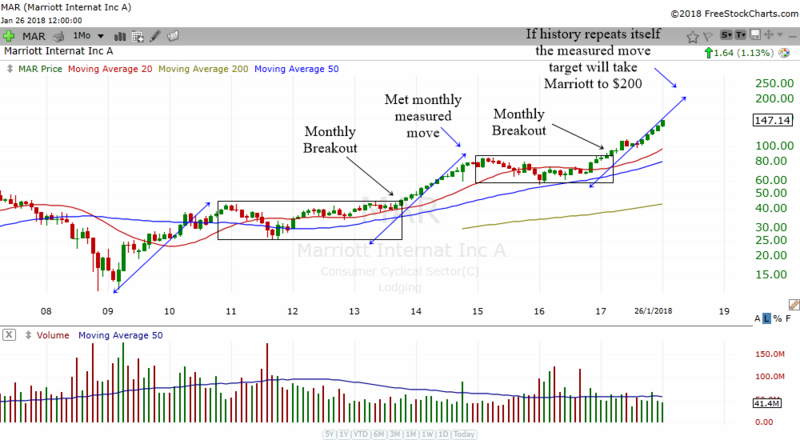 Marriott is in a strong daily uptrend. Since it is in an uptrend, you should continue to be bullish on this stock till the trend changes. More upside is likely in this stock. 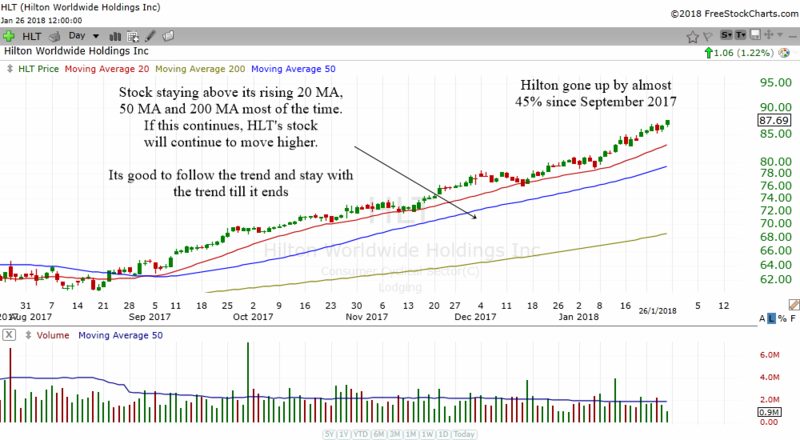 The chart above is the daily chart of Hilton. No, not Paris Hilton but the hotel that was founded by her great grandfather, Conrad Hilton. Today, Hilton is a symbol of luxury living during travels. The stock of Hilton has gone up by almost 45% since September 2017. Another incredible feat for a luxury hotel stock. Notice how the stock stayed above its rising 20 MA, 50 MA and 200 MA most of the time. As long as it continues to stay above these rising moving averages, there will be more upside for this stock. The stock chart above is the daily chart of Hyatt. Hyatt always reminds me of the childhood memories that I have when my dad brought us to stay in a Hyatt hotel. We stayed in Hyatt Kuantan, Malaysia quite a lot when my dad used to go for working trips there. That's where I met two German kids called Kim and Kye and we had quite a lot of fun together. The trend is your friend when it comes to Hyatt. 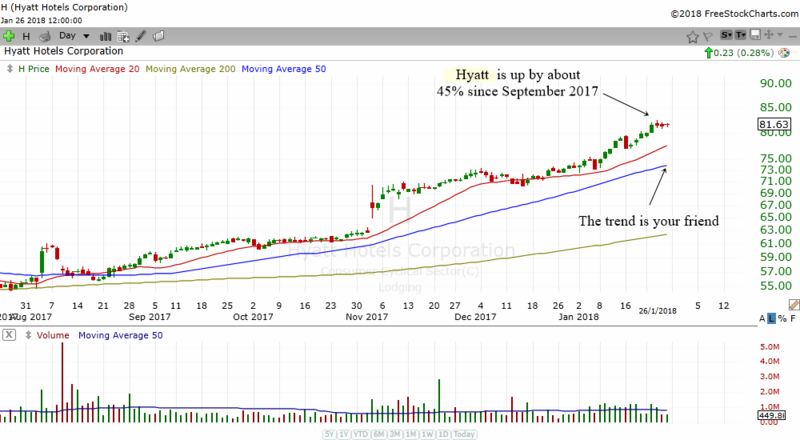 Hyatt is up about 45% since September 2017. 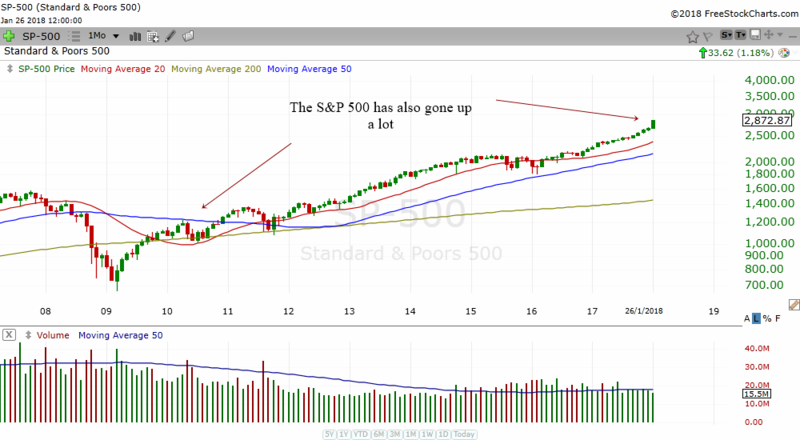 The chart above is the daily chart of the S&P 500 index. When you compare the chart of the S&P 500 with the chart of those luxury hotels, you will agree that surging stock prices of these hotels indirectly hints to a surging S&P 500 index. The stock market gives out many hints to those who are observant. One of them is the performance of luxury hotel's stock prices. 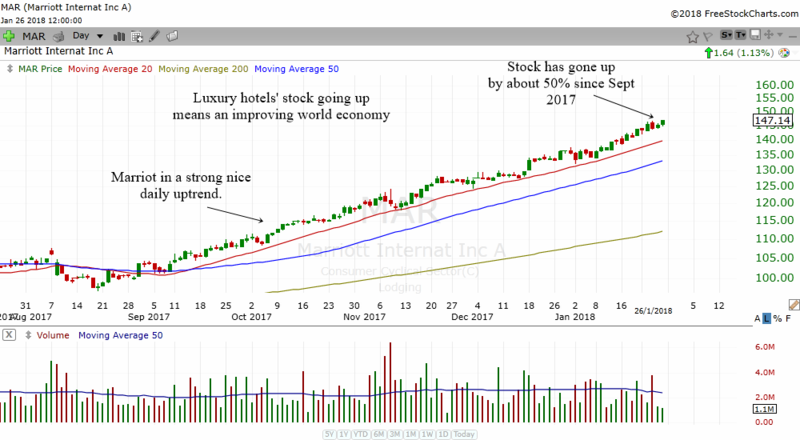 Let's take a longer term view of Marriott. The chart above is the monthly chart of Marriott's stock. The stock has been in a monthly trend for a long long time. It broke out of 2 monthly consolidations which send it higher. The last time, it met a monthly measured move before drifting sideways. If history is correct, then the measured move in the monthly breakout will bring Marriott's stock price to $200. The chart above is the monthly chart of the S&P 500. Notice how the index has also gone up just like Marriott. A better way to see the effects of hotel's on the S&P 500 is to compare the Lodging industry's monthly chart to the monthly chart of the S&P 500 index. Notice how the Lodging index formed a double bottom and bottomed earlier than the S&P 500? This gave subtle hints that the situation in the US market was going to improve. 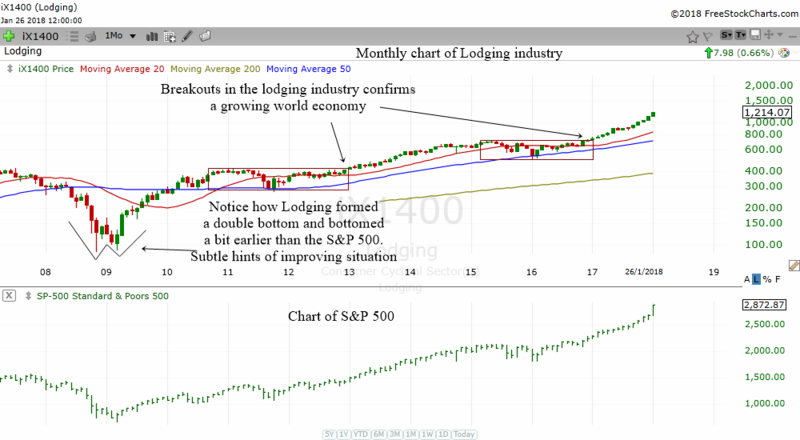 The two monthly breakouts in the lodging industry also confirmed a growing world economy. Today, the S&P 500 no longer represents the US economy alone. 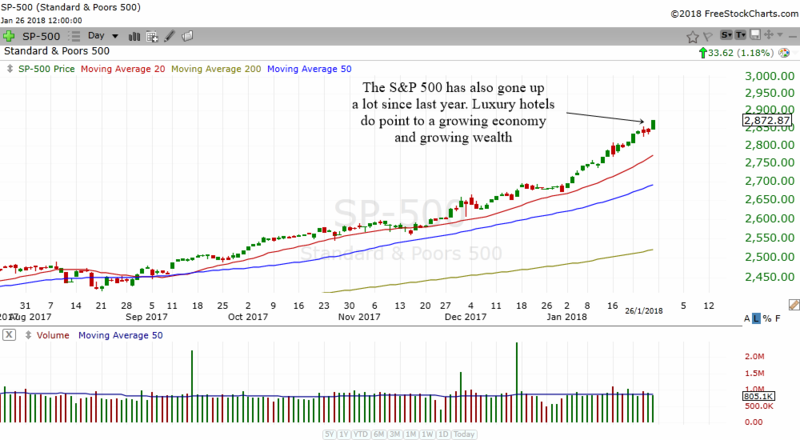 Because more and more of its profits come from outside US, the S&P 500 is actually a better reflection of the world economy. I hope that this article has helped you understand a little bit more about the complexities of intermarket analysis. Perhaps you have never thought of using luxury hotels as a gauge of wealth and growing economy. But when you really think about it, it makes sense right. If companies and people have more money to spend staying in luxury hotels, it means that their businesses are growing. On the other hand, when spending slows at these luxury hotels, it means that companies' earnings are slowing down as well.